I started riding in 1978 on a Suzuki 360 then up to a GS550. While I loved riding there were very few women at that time and the bike was just to high for me. I am only 5'1" and I had to tip toe it. I rode on and off for about 10 years but never put on a lot of miles. I got divorced in '89 and remarried in '90. My hubby didn't ride so I just gave it up. In August 2009 my hubby decides he wants to get his license, takes the class, passes and 2 days later we bought our first Harley's. He got an '09 Dyna and I got an '09 Sportster 1200L. In Feb, '10 I traded in the Sportster for a '10 Softail Heritage Classic. It was the best thing I ever did. I have been so much happier. I had it lowered an inch, put on a tour pack and haven't looked back. Between August and November I had about 4000 miles on the Sportster and my Heritage this last year I got just under 10,000 miles. For Memorial day this year I am riding to DC. We live in the Chicago area and I am going to be 60 this year. Comments for Never Too Old! Riding is all I think about, even in the dead of winter! Unfortunately my husband does not like riding quite as much as I do. He's got the Heritage Deluxe, while I'm happy as a clam on my Suzuki C50 Boulevard. Remember, We, that are in a\our more mature later years only have so many Saturdays left. So make them all count! I call riding my Wind Therapy! I took my class in 2006 and haven't looked back since. I call riding my wind therapy as it relaxes me and helps to clear my mind. I didn't get to ride much this past year as my Mom was pretty ill and I was her caregiver. But look out this spring I'll be out on the road again getting my wind therapy. I'm now 50 and I'm loving life now. I raised my kids and took care of my Mom and no grandkids yet so now it's me time! You go girl and I recommend riding to all the ladies. I rode behind the hubby for over 30 years but not any more. 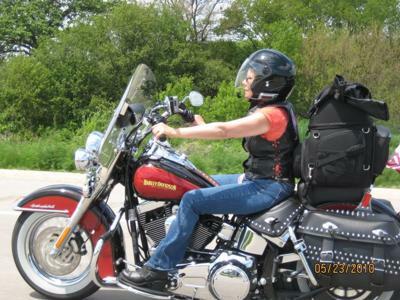 I'm only 5'2" and now ride a HD Roadking although I still have my favorite Fatboy also. This is inspiring and I hope all who read this will have the courage to give it a try. I know they will love it. I rode on my hubby's bike for quite a few years, then wanted to give it a try. I started riding by myself 8 years ago, and will never give it up. It's like a tension-release for me. And it's fun to get together with other riders and discover places I had never been to! I started for 1 season on a Honda Rebel 250, and then bought a 2000 Honda Shadow VLX (600). I am ready for a bigger bike, would love the Shadow Aero, or Spirit 750's. So ladies... NEVER GIVE UP!!! If you wanna do it, DO IT! Take the class and learn and practice all you can! Never give up. Most states offer classes that don't cost much (in Illinois they are $20.00) and can really help you. If you pass the class you have your license. I still have a problem with u-turns but they are getting better. You can do it! Keep the shiny side up. Hey, that gives me hope! I bought a Honda Shadow last year, never rode, didn't know how. Didn't pass my road test, but I am going to try again this spring. I'm 55.